7/24/2014 - Top-down… and busted. You know, I think this is probably not busted. In fact, it's kinda awesome. However, I think it should cost 5U. Look at Flow of Ideas, Howl of the Night Pack, Spire Barrage, etc. The fact that they only cost a single colored mana allows players to think, "Hmm, should I put this in my three-color deck? Oh, wait, no, it would be way better in a mono-blue deck!" 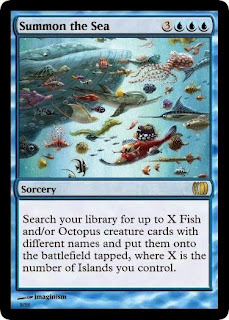 Or maybe they'll draw it during a game and think, "Man, this card would be way better if I had more than one island." Those are good teaching moments. Good call. Not like getting a single fish for 5U would be a problem. The unfortunate thing is that just like whelming wave, there are so many aquatic species that it's just difficult to make this card feel "complete". The fact that Whelming Wave hits Squid but not Octopus and then M15 printed a playable Squid is just the worst. One thing I would question is if this card is actually blue. I mean, if this were grabbing any other creature types, it would be unquestionably green. I'm not sure if the creature type limitations really justify the mechanical bleed. The whole creature type thing is certainly awkward. Particularly when we draw lines between things like squid and octopi, but not sharks, whales and flounder. This is definitely a mechanical bleed for blue, though we can make exceptions for really flavorful and fun cards, and one could argue something that gets creatures of a color via lands of a color could go anywhere much as the Paragons do. Even so, I can't help but chuckle at the idea of keeping the text exactly the same but changing the cost to 5G. That'd probably work in the right set! Choose an opponent. Each of you secretly chooses X creature types. Then search you may search your library for up to three creature cards of a type you named and not of a type your opponent named, and put them onto the battlefield. "Guh... okay, I name Ooze so you can't Acidic Slime me... and definitely Treefolk to stop Primus and Primordial... and Elephant." 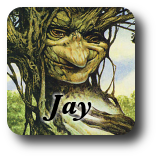 "Sylvan Primordial is an Avatar! Ha-chaw!" There is almost certainly a simpler version of this that is more appealing. Maybe with a fixed cost and tutoring for only one creature? Does anyone else like this idea? Each opponent names a creature type. Search your library for a creature that isn't that type, reveal it, and put it into your hand. Shuffle you library. Beckon's a cool idea. The X is definitely unneeded. Racist Tutor is much simpler with the same basic gameplay. I do find it an odd choice to actively make a card *worse* in multiplayer. I dislike tutors in EDH, what can I say?